I eat a lot of wild salmon, mostly for its health benefits, and because I follow a mostly pescatarian type diet. That means I rely mostly on seafood for my protein. 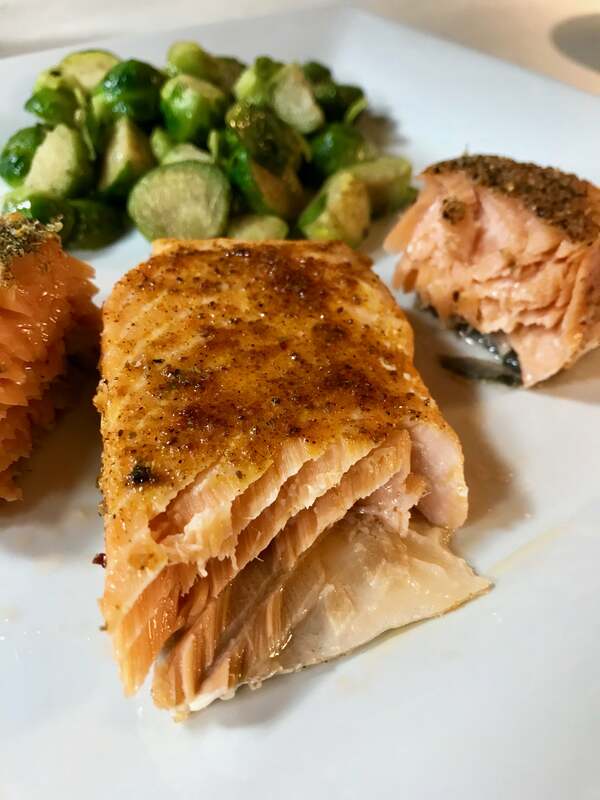 I don’t love salmon as much as, say, sablefish (super mild and buttery– check it out and make this recipe), but when it’s cooked properly, it is sublime. And slow roasted salmon is the way to go if you want sublime salmon. Also, don’t shy away because it’s fish or salmon or slow roasted. 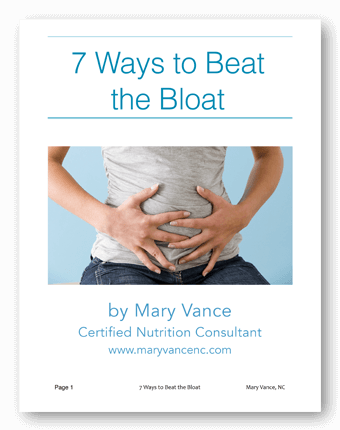 This recipe is super easy and very delicious. 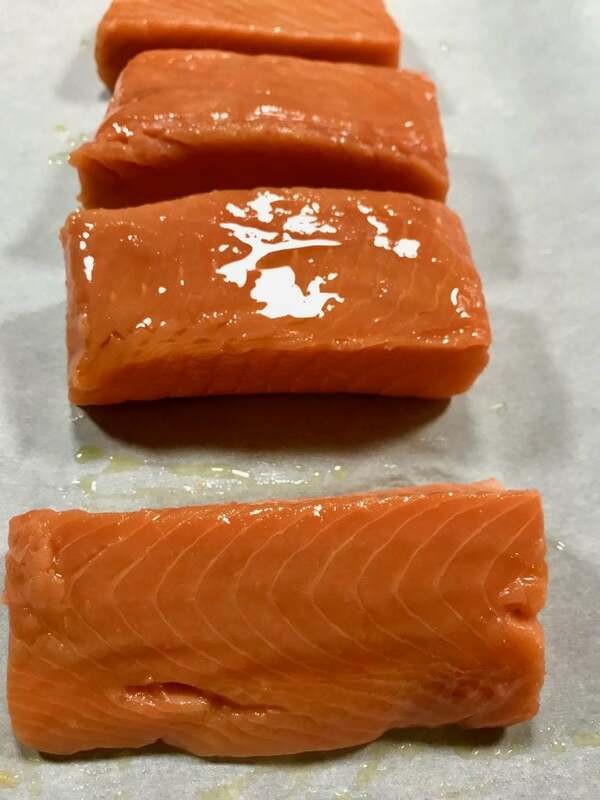 Wild salmon is rich in anti-inflammatory omega 3 fatty acids; it’s high in protein; it’s rich in B vitamins; and it contains the anti-aging antioxidant astaxanthin which gives it the pink-red pigment. 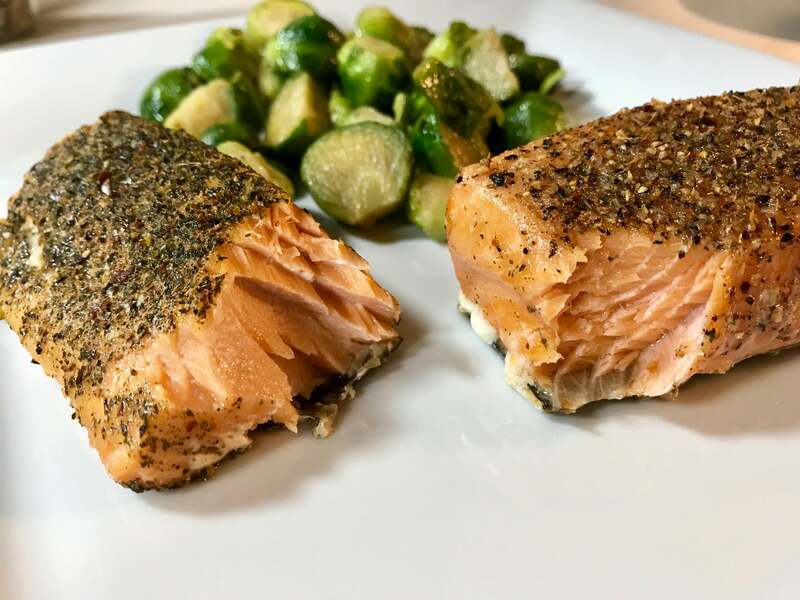 Always choose wild salmon, as farmed salmon has a completely altered fatty acid profile (higher in inflammation-promoting omega 6 fatty acids), and the fish are raised in poor conditions and fed pellets that aren’t even close to a salmon’s natural diet (read more here). Color is often added to make the flesh look redder. Many people shy away from salmon because, they report, it tastes fishy. 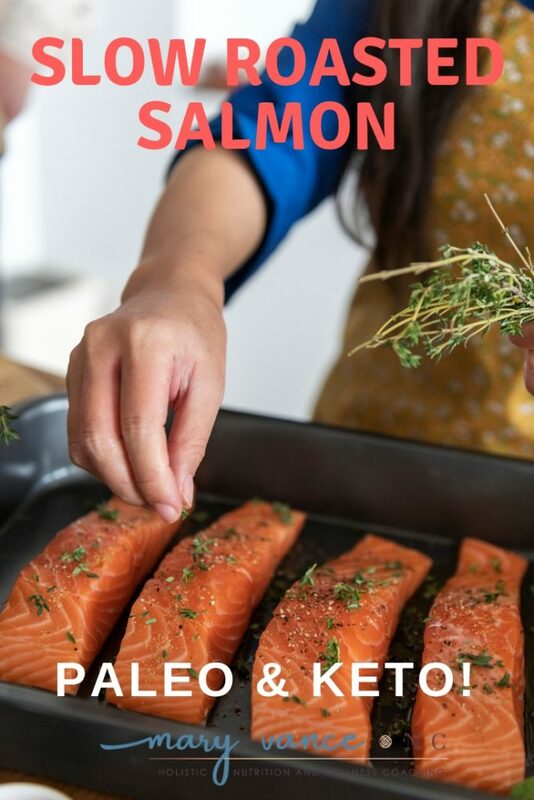 The key in preventing this is not only to cook it properly and rinse it prior to cooking, but also to start out with the best piece of salmon you can find. That means the freshest and wildest. I opt for wild King salmon, and yes, it is pricey. Coho and sockeye are much cheaper (sometimes less than half the price) and easier to find frozen wild, but they’re just not as good. They tend to be much drier. The second reason people shy away from salmon, or any fish really, is fear of cooking it properly. Fish tends to get cooked to death and turns out rubbery and dry. Fish is seriously the easiest protein to make if you use the oven. Roasting fish is fast, easy, delicious, and it’s passive cooking: You put it in there and leave it. It retains moisture and flavor and is really hard to screw up. 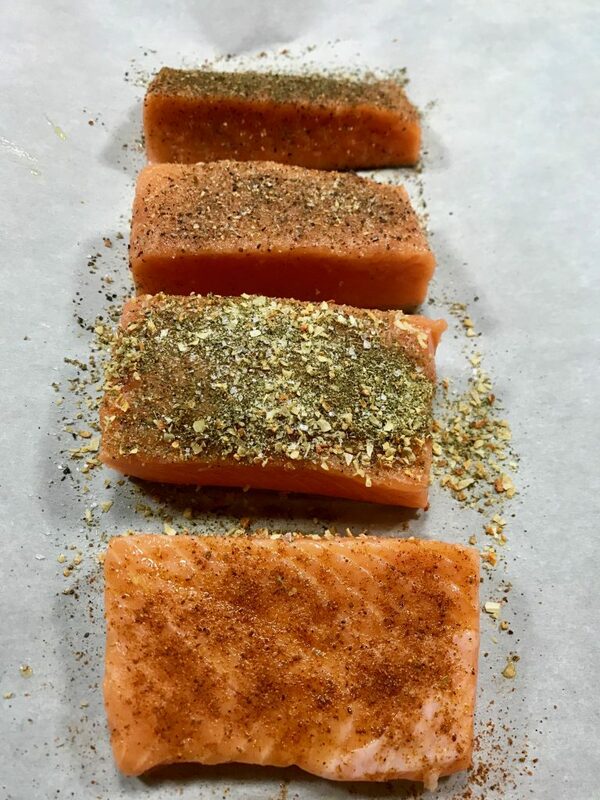 Most weeknights I sprinkle a small piece of wild salmon with a spice blend and pop it in the oven at 375 for 10-12 minutes. It comes out great. The key is to remove it from the oven when it’s a bit rare, as it’ll firm up as it sits. 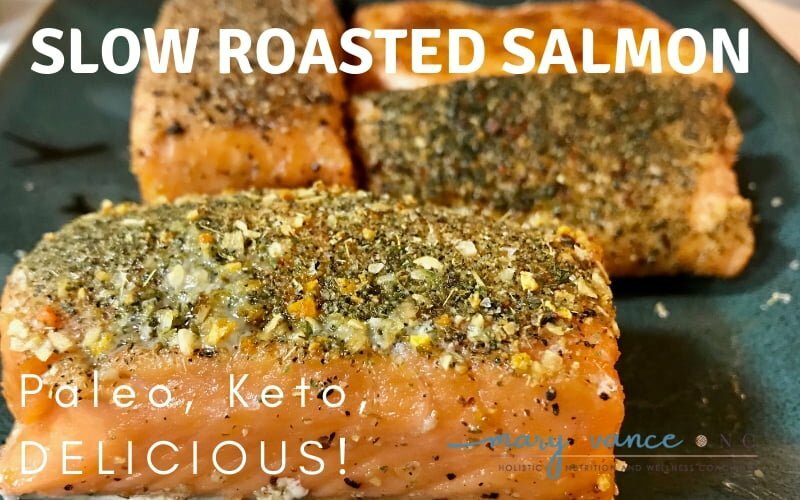 But if I’m in the mood for something even more delicious, or if I’m entertaining and want to wow my guests, I take it up a notch and make slow roasted salmon. It’s super easy, just takes a bit more time. What you need: one pound of fresh, wild salmon. Best the day you buy it. I recommend King salmon, but Coho works also; it just doesn’t need as much cooking time. You also need a baking sheet, some parchment paper or a silpat, and a marinade or spice rub, whatever you fancy. First, cut the fish into appropriate portions, then drizzle it with olive oil. 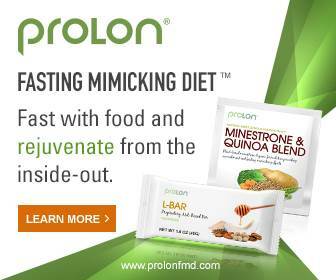 Next you’ll need to decide on your flavor profile. You can use spice rubs or make a marinade. I have a Thai spice blend I often use. 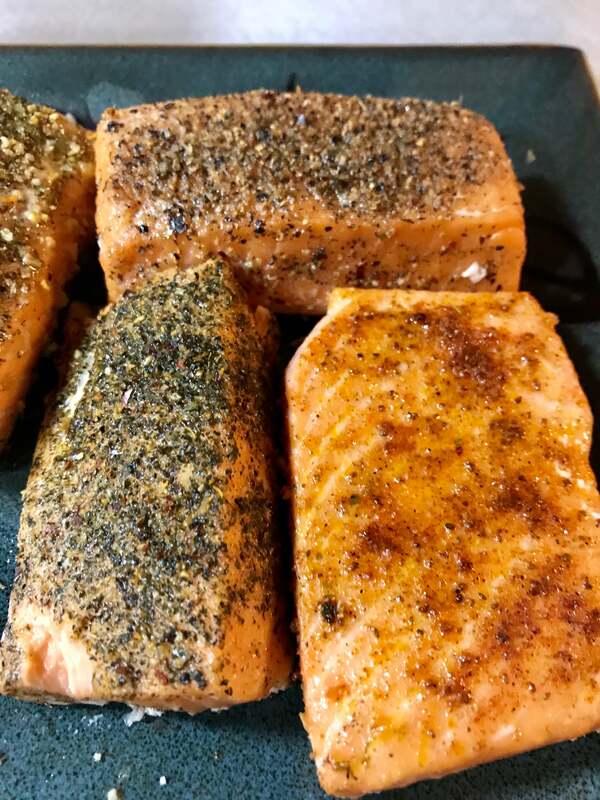 Sometimes I just use plain ole Old Bay; often I’ll use the 21 herb salt free blend and add sea salt; or one of the best salmon rubs is a combo of brown sugar, thyme, chile powder, and paprika. You can buy it here or whip it up yourself. Or you can mix up a marinade (I like sesame oil, tamari, lemon juice, garlic); brush it with butter and stick some lemon slices on top; really, whatever sounds good works. Anyway apply your chosen flavor rub/marinade. Let it sit on the baking sheet for 30 minutes. Be aware that over-marinating can ruin the flavor, but you have more flexibility with the spice rubs time-wise. I put a bunch of different spice blends on these, as I am wont to do. Preheat the oven to 275F. (note: I’ve also tried it at 250, and it just took too long. It might be because I have a vintage oven though. 250 may work better for Coho or Sockeye). Put it in the oven and start checking it after 20 minutes. It can take anywhere from 20-30 minutes depending on your oven. When it’s done it won’t look like typical cooked salmon. It may still look a bit pearly, but it’ll flake like salmon that’s finished. That’s it! Super easy. I enjoyed these with some simple Brussels sprouts for an easy, delicious dinner. It’s also good cold the next day! 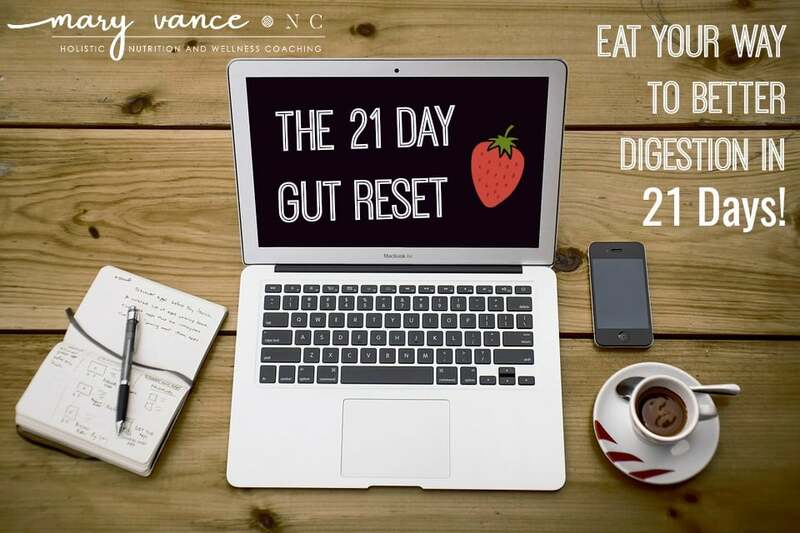 Try it over a mixed green salad or flaked inside half an avocado for an easy breakfast! And don’t throw away the skin– eat it or feed it to your pets. I love salmon,and know about it’s health benefits. Have a hard time finding wild salmon, most grocery stores are selling farm raised. I live on east coast. Is there a specific store or place to by fresh King salmon?